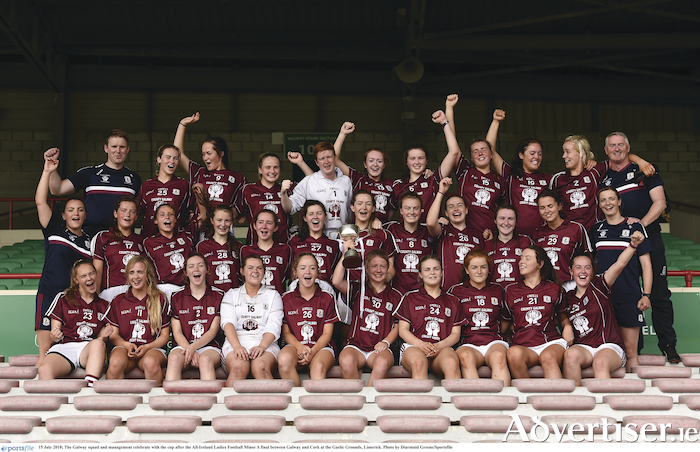 Galway have been crowned All-Ireland minor ladies football champions, denying opponents Cork a fourth consecutive title when they met in Sunday's decider at the Gaelic Grounds in Limerick. By the narrowest of margins, 5-7 to 2-15, Galway secured the U18 crown- the first time in five seasons the Tribesgirls have prevailed over Cork in the final. Andrea Trill led the scoring with a goal hat-trick, with Aoife Thompson and Kate Geraghty adding two, ensuring Kieran Collins' side prevailed. But in the end it was a tight affair as Cork refused to bow out right up until the final whistle. The sides were level three times in the first quarter until Galway secured their opening goal. Chloe Miskell and Molly Hynes were involved before Trill finished to the net for a 1-3 to 0-3 lead, but the Rebelettes bagged five unanswered points to go 0-8 to 1-3 in front. Galway struck again through Thompson on 25 minutes, and although Katie Horgan levelled for the fifth time at 2-3 to 0-9, Galway struck a third major when Trill finished to the net and added a free for a 3-4 to 0-9 lead. Geraghty deceived Sarah Murphy for a fourth Galway goal on 34 minutes, putting them 4-4 to 0-9 ahead, but Cork refused to bow. They struck a point and a goal, but Galway's captain and player of the match, Lynsey Noone, produced another attack, with Trill bagging the fifth goal to leave it 5-4 to 1-10 on 41 minutes. Although looking dead and buried, Cork again stormed back with substitute Clare Nevin netting eight minutes from time to level the tie 5-5 to 2-14. Galway, however, kept their composure to land scores from Hynes and Miskell to lead by two, and although Abbie O’Mahony replied for Cork, they missed other chances as time ran out, ensuring a sixth All-Ireland crown for Galway. Galway : Karen Connolly; Lorraine Meehan, Maeve Flanagan, Chelsie Crowe; Kate Geraghty, Laura Ahearne, Lynsey Noone; Shauna Boyle, Amy Coen; Aoife Molloy, Chloe Miskell, Ciara McCarthy; Aoife Thompson, Andrea Trill, Molly Hynes. Subs used: Lara Finnegan for Boyle (47 mins ), Katie Quigley for Flanagan (55 mins ), Aoife Coen for Amy Coen (59 mins ).